The distant planet GJ 1132b intrigued astronomers when it was discovered last year. Located just 39 light-years from Earth, it might have an atmosphere despite being baked to a temperature of around 450 degrees Fahrenheit. But would that atmosphere be thick and soupy or thin and wispy? New research suggests the latter is much more likely. 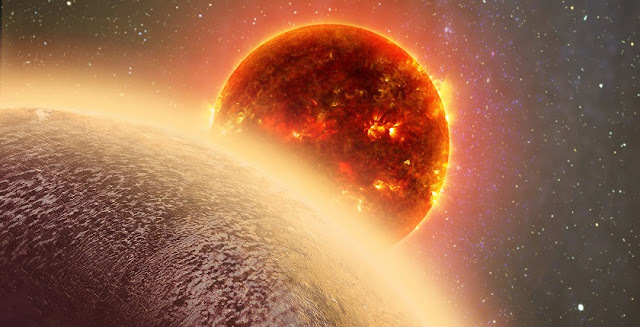 Harvard astronomer Laura Schaefer (Harvard-Smithsonian Center for Astrophysics, or CfA) and her colleagues examined the question of what would happen to GJ 1132b over time if it began with a steamy, water-rich atmosphere. This work has been accepted for publication in The Astrophysical Journal and is available online. The journal paper is authored by Laura Schaefer , Robin Wordsworth, Zachory Berta-Thompson (University of Colorado, Boulder), and Dimitar Sasselov (CfA).